Politics – Or Racism & Bullying? Pilling should be offered counselling, his behavior has become increasing erratic. He has no idea on issues like Frogmore or the Skyrail. He just follows Hyam like a little loyal puppy dog. $30000 spent to get rid of one bloke and they still haven’t got the guts to go to a panel where they have to produce their evidence. They haven’t gone cos they know it wont hold up. Solution is to hold a kangaroo court and indulge in maybe slander. Obviously the motions are defamatory. Remaining question is whether there is a defence available eg whether they are fair comment or honest opinion. Council must be aware it hasn’t so far identified a breach of its Code of Conduct; hasn’t stated the definitions of racism or antisemitism it is using; hasn’t truly stated the facts [note the use of “[Jewish]” in their allegations]; hasn’t shown a relationship between the facts and the definitions they are relying upon [if they exist]. They have also published a letter from a lawyer pointing out they have provided no substantiation, and that they haven’t followed the procedure in their Code of Conduct. On top of this they have specifically included The Australian Jewish News in the list of publications to advertise their defamatory opinions. The second motion is an example of an attempt to divert attention. It is simply a fact that Cr Lobo has been subject to harrassment and bullying over the 7 or so years of being a councillor. It can be seen whenever Cr Hyams or Cr Lipshutz raise points of order repeatedly to silence him. Instead of stating one of the 5 grounds in their Meeting procedure, they head off into irrelevance. The Mayor, inevitably a mate of the interjectors, then fails to give reasons for the decision as final arbiter of all points of order, reinforcing the impression it is an attempt to silence a political opponent. Similar tactics were used against Cr Penhalluriack. We are now seeing them use the tactics of ostracism and exclusion, all part of a bully’s arsenal. We don’t know what Council’s motivations are, and as a result racism cannot be excluded. When Cr Lipshutz asked whether Cr Lobo had worked for a bank linked to terrorists, it wasn’t fair or innocuous. Whether it was racist depends on Cr Lipshutz’ motivation for the question, which he didn’t disclose. It was certainly offensive, about as offensive as if somebody asked a member of the jewish community if they were linked to terrorism. I’ve had a gutful of the elitism and exceptionalism that underpins Cr Hyams and Cr Lipshutz’ behaviour. I don’t understand why so few other councillors have called out their unacceptable behaviour. I think the current Council is beyond redemption, but it will probably stagger along, causing further damage and disharmony until the next election under the leadership of Neil Pilling. He should resign if he cannot perform the functions of the Mayor, which include 73AA(a) [guidance to councillors; observation of councillor code of conduct] and 73AA(b) [supporting good working relations between councillors]. Thanks Reprobate, I’ll try to stimulate a more informed debate. How come no mention in the Leader of Lipshutz comparing Lobo with the Commandant of Auschwitz, or his statement about his own father killing Nazi’s? There are big problems with Glen Eira councillors, they continually waste ratepayer money holus bolus on their personal petty assassination of each other. Meanwhile Glen Eira suffers a crisis with democracy and poor planning outcomes and problems with open space, traffic just to mention a few. It’s about time these Cr’s put their petty egos to one side and deliver the outcome that residents expect from their councillors. However comparing another Councillor to the Commandant of Auschwitz is just as dumb and frankly offensive as Lobos original statement. 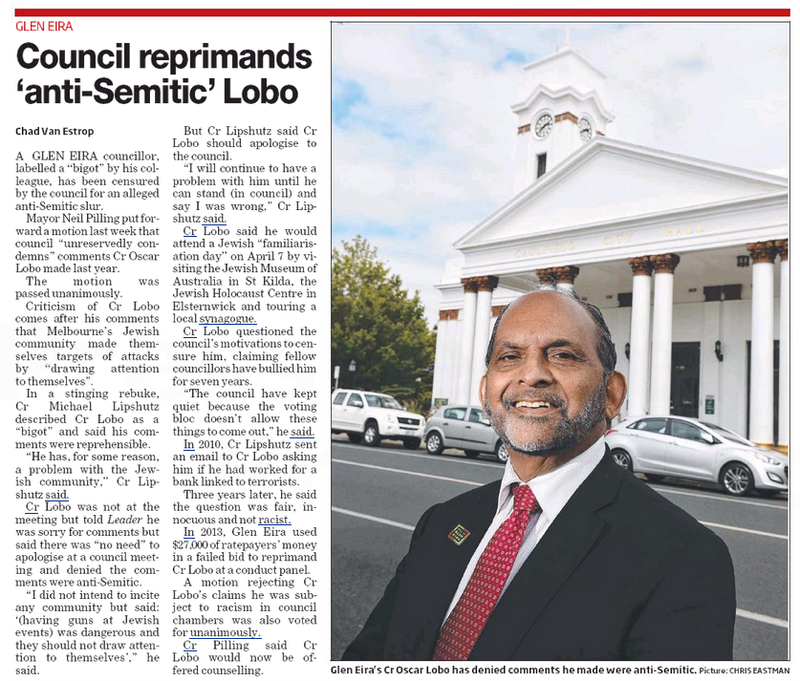 I guessing Lobo isn’t a Nazi, and to insinuate he is a Nazi, also insinuates the residents of Glen Eira have elected a sadistic murdering Nazi like the Commandant of Auschwitz. Lipshutz’s public outburst is not proportional to the crime committed by Lobo. Justice in our system is premised on the reason that the punishment must fit the crime committed. Lipshuz’s uncontrolled ill-thought out-busts says more about him than Lobo’s initial stupid remark. The bottom line being, this type of immature behaviour among our Councillors is unhelpful to good communality relations. All of these self serving councillors who have forgotten they are there to run this once beautiful group of suburbs that fall within the Glen Eira area need to be sacked. They are developers puppets, full of their own importance and are like school kids who form little groups. Can someone confirm Anon 1.35pm with regards the opening paragragh? Could ask Council for their tapes (after all it was a meeting, open to and attended, by the public) but since Council won’t even provide the appropriate tapes to the lawyers they hire to give advice I wouldn’t hold out much hope. Doesn’t matter if it was said, the comment can be left to do it’s damage regardless. Most comments do. It’s not as if this is a moderated comment board. No one should be surprised. The whole modus operandi of extreme orthodox Jews, of which Lipshutz and Hyams are part, is not to debate matters concerning the Jewish community but completely shut down and stigamtise their critics. It is the cornerstone of the AIJAC, for whom Hyams works as a propagandist. Jewish writer and social commentator in his book “My Israel Question” (which you won’t find in any GE library – funny that) which a prominent member of the Jewish community and current Parliamentarian attempted to stop being published tells of how the extremist Jewish lobby goes about this. If you criticise Israel, their methods, or their people in a reasonable way you are labelled anti-semetic, if you aren’t of the faith, and a self hating Jew, if you are of the faith. Top-notch effort moderators! Any fair-minded readers have an issue with these sort of comments…anyone??? Which part of those remarks are inaccurate and why? what is an ‘extreme orthodox Jew’? There is no such grouping. Either way you can’t ascribe a modus operandi to a group of people who happen to be of the same faith. You may ascribe a modus operandi to an individual or organisation. Kinda like saying ‘typical Jews, they’re always…(insert any age old slur)’. Oh and if you want to check the accuracy of the original commenter. Try searching the library for my Israel question – currently available from Caulfield library. Well! You’d hardly call either moderate would you? Hyams is a propagandist for an organisation which works extremely hard to stop people airing views that are critical of Israel. Lipshutz was the key Councillor agitating to have Lobbo castigated and silenced and who is an Israel ‘right or wrong’ apologist. Hardly moderate either of them. The treatment of Lobbo was not only a misuse of Council time and resources by a largely incompetent Council, more importantly it was a denial of the primary value of freedom of expression. Bloody shame and both Lipshutz and Hyams have commenced projecting a evil image of their own community. Good on Lobo who is the only Councillor in the history of GECC. It is not my style to write without my proper name. And I do not deny that I read this blog. As a matter of fact I stood in one of the meetings and said what I had to say. You are not coming to the gallery and when you come next please introduce yourselves to me. We will have a coffee together after the meeting. My shout! It appears you have a mash in your head. Nothing is gone to my head as I do not have the brain material like you. I suggest that you spend time with your family and take up their home work instead of writing on this forum. It also appears that you guys be a racist from your ancestral family tree. On the wake up call from petticoat garment no: 2 I am not for publicity unless I can contribute to anomalies. This is my response to your allegations. Stop boasting and cease wriring without rubbish. A story has three side. How many sides did you have before using your mash brain. yesterday’s Leader section of the Herald Sun. is better she sticks to nursing the wounds. parties dancing her ways away. Abraham Lincolns saying applies here. 2013) so that my constituents are not placed in a confused state of mind. a garage or more than one car misses out on their own streets. To the skeptics please back off and let the Councillors do their job. Once again remember, a story has three sides. Only people who were rightly sacked in 2005 now found grasping on straws will dig sh*t for themselves. Agree with anonnymous 4 and others. The gang with the help of Pilling condemned Lobo and repeated history with the help of two times Mayor who found a loop hole of being rewarded and given mayors position and in turn sold other residents for the awards. Only an educated person with some common sense would postpone for a robust debate. The story of the mischievous will continue for trickery and abuse of democracy. Jesus Christ. Enough bull. How about we call a spade a spade? Lobo is a dunderhead, a naive fool and plenty of other things. Heart might be in the right place but he’s got no idea of how to go about it. He is not a political animal like some. He blurts stuff out that is embarrassing to the ruling classes because it shows up their wheeling and dealing behind closed doors. That’s unforgiveable. Now whether or not he is an antisemite or a racist I’ve got no idea. What is not in doubt he hates Hyams and Lipshutz. They happen to be jews. Does that make him an antisemite? I’d guess they hate him too. Are they racist? Several folks have told me that every time Lobo gets up to speak these guys smirk, roll their eyes, and gesture across the chamber. Unseemly behaviour but not picked up by our fabulous recent mayors in Magee and Pilling. I’d call that conduct unbecoming. Personally, I am inclined to believe Lobo when he tells the Leader that he’s been bullied. Council is an expert in that. Agreed Mecca, I’d take the word of a Pacific Southern University graduate every day of the week! I voted for Lobo does that make me anti-Semitic? Not to me, but to Hyams and Lipshutz most probably. Some small ethnic groups strengthen their members’ commitment by inventing imaginary situations and enemies. This group had members letterboxing urging people to witness the slaying of a councillor who any normal AUSTRALIAN WOULD HOPE COULD BE FREE TO EXPRESS AN OPINION CONCERNING WHO WOULD LIKE TO HAVE “GUNS IN THE MUNICIPAL PARK”. It seems a really threatening situation to me as most people in AUSTRALIA WOULD AGREE THAT THE “gun mania” in United States makes it a terrifying place to live. A visit to the American embassy gives one the jitters, or any park there, St Patricks Cathedral had guards armed with automatic machine guns on the front steps, all the shops are “protected” by armed guards and even the parks. This was extremely frightening in fear of accidents which do not occur if the guns are only used by authorised police officers and NO ONE ELSE. PLAY WITH GUNS SOMEWHERE ELSE!!!!! Yes Anon. it would seem that according to the rules determined by Messrs. Hyams and Lipshutz then you would be considered anti-Sematic and they rule this council. Macca has summed it up. Time to get a Council that functions properly and focus on the important issues and trul have an open mind when dealing with these issues. Roll on elections. Anyone willing to stand? This may be a case of a extreme orthodox person a sad case of of a home grown young person with extreme views that led to extreme actions. I think this is tragedy for this young man, and without saying his victims, what has gone wrong when our education system and community when it turns out youth that behave like this. If this isn’t a warning to stop the divisive racist rhetoric, what is? There is only one way forward, respect, understanding, and wisdom, armed with this we can achieve great things. The act in the last council meeting shows condemnation without the person present. History repeats and this is truly bringing the words of NOSTRO DAMUD. Where is Ba….s?